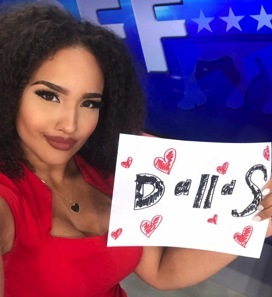 Dallas-based TEGNA8’s lengthy search for a new weekday morning traffic anchor has stopped with Demetria Obilor, who was introduced Friday at the close of Daybreak’s 6 a.m. hour. Obilar, who starts on Monday, Oct. 23rd, arrives from Las Vegas’ “8 News NOW” (also known as CBS affiliate KLAS-TV), where she’s also been doing traffic for the past few years. The University of Kansas graduate earlier prepped as the traffic reporter for NBC affiliate KSHB-TV. Lauren Nevitt, a Lake Highland resident and graduate of Dallas’ Bishop Lynch High School, will now work the early morning weekend shift. She also had been what now turns out to be the interim weekday Daybreak traffic anchor. TEGNA8 had been looking for a replacement since DeSoto police sergeant Nick Bristow was dropped in January of this year after two-and-a-half years with Daybreak. Obilar also is notably active on the “social media” front, an arena which Daybreak has been selling hard of late in an effort to climb out of third place in an increasingly closely fought early morning ratings race still headed by Fox4 and NBC5. Janelle Brandom joined Daybreak in June as the program’s “social media anchor” and is now featured daily in Twitter- and Facebook-driven segments. Obilor, who has nearly 30,000 followers on Twitter and 49,400 on Instagram, is not shy about showcasing herself and won both the Grand Prize and People’s Choice Awards at Las Vegas’ Container Park Fashion Show. As previously posted, TEGNA8 continues to search for Daybreak co-anchor Alexa Conomos’ replacement. She lately has agreed to stay on until the end of the year after first announcing in January that she would be leaving Daybreak to spend more “normal” hours with her husband and their three young children. The two apparent frontrunners for the position are TEGNA8 incumbent Sonia Azad and Vinita Nair, both of whom have joined anchor Ron Corning on the air this month. Nair, who was raised in Colleyville, TX, most recently co-anchored on CBS This Morning Saturday with Anthony Mason, who lately has been filling in for Scott Pelley on the CBS Evening News while the network looks for a permanent successor. Nair left CBS in November of last year. TEGNA8 news director Carolyn Mungo does not comment on personnel matters, or anything for that matter, to unclebarky.com. She is alone among D-FW news directors in that respect. The station has a “content-sharing” pact with Fort Worth’s Star-Telegram, to which news of TEGNA8 personnel matters has been directed previously. In Conomos’ case, she was told to comment on her planned departure only to the Star-Telegram.